Washington (CNN) – Hillary Clinton's frenetic book tour appears to have paid off: In its first week on the market, her memoir "Hard Choices" was the most purchased hardcover nonfiction book in the United States, according to Nielsen Bookscan data. Booksellers who report to Nielsen – which makes up roughly 85% of all retail book sales – have sold approximately 86,000 physical copies of "Hard Choices" since June 10, according to the data provided to CNN by Nielsen. The Nielsen numbers do not include tablet and e-book sales. 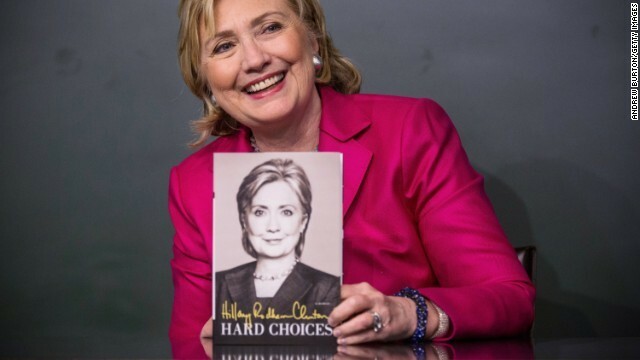 On Tuesday, a source with Simon & Schuster, Clinton's publisher, told CNN that roughly 100,000 copies of "Hard Choices" were sold in the book's first week when you combine hardcover, e-book and preorders.